LIVING ON CAMPUS averaged $68,106, lower than a year ago when a number of high-cost projects were reported. Cost per sq. ft., however, rose slightly, to $202.86. Space allocated per bed in the median project was 312 sq. ft., calculated by divid- ing the entire size of the building by the number of students housed. The space per sleeping area would be much smaller. 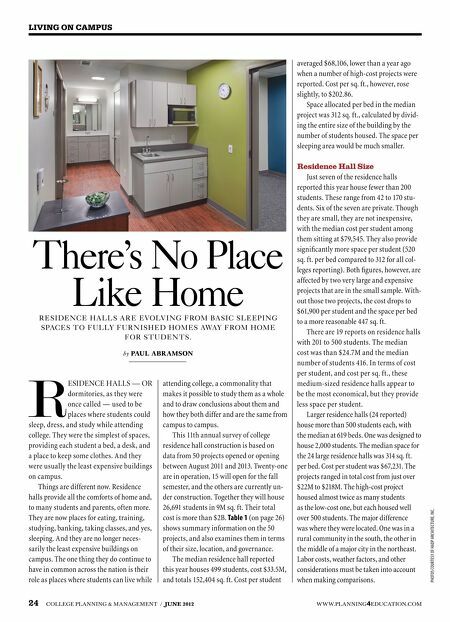 Residence Hall Size Just seven of the residence halls There's No Place Like Home RESIDENCE HALLS ARE EVOLVING FROM BASIC SLEEPING SPACES TO FULLY FURNISHED HOMES AWAY FROM HOME FOR STUDENTS. by PAUL ABRAMSON R ESIDENCE HALLS — OR dormitories, as they were once called — used to be places where students could sleep, dress, and study while attending college. They were the simplest of spaces, providing each student a bed, a desk, and a place to keep some clothes. And they were usually the least expensive buildings on campus. Things are different now. Residence halls provide all the comforts of home and, to many students and parents, often more. They are now places for eating, training, studying, banking, taking classes, and yes, sleeping. And they are no longer neces- sarily the least expensive buildings on campus. The one thing they do continue to have in common across the nation is their role as places where students can live while attending college, a commonality that makes it possible to study them as a whole and to draw conclusions about them and how they both differ and are the same from campus to campus. This 11th annual survey of college residence hall construction is based on data from 50 projects opened or opening between August 2011 and 2013. Twenty-one are in operation, 15 will open for the fall semester, and the others are currently un- der construction. Together they will house 26,691 students in 9M sq. ft. Their total cost is more than $2B. Table 1 (on page 26) shows summary information on the 50 projects, and also examines them in terms of their size, location, and governance. The median residence hall reported this year houses 499 students, cost $33.5M, and totals 152,404 sq. ft. Cost per student 24 COLLEGE PLANNING & MANAGEMENT / JUNE 2012 reported this year house fewer than 200 students. These range from 42 to 170 stu- dents. Six of the seven are private. Though they are small, they are not inexpensive, with the median cost per student among them sitting at $79,545. They also provide signifi cantly more space per student (520 sq. ft. per bed compared to 312 for all col- leges reporting). Both fi gures, however, are affected by two very large and expensive projects that are in the small sample. 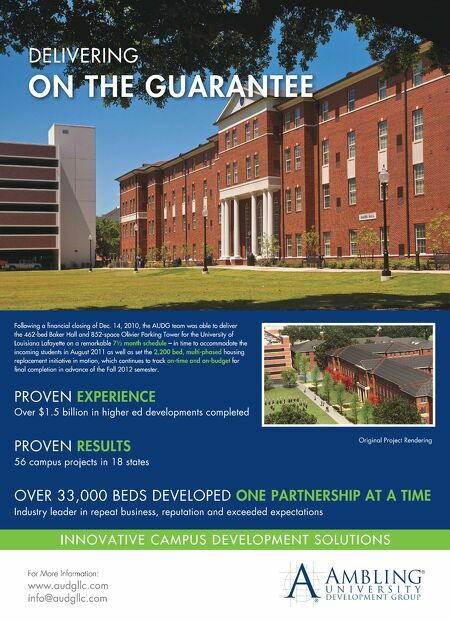 With- out those two projects, the cost drops to $61,900 per student and the space per bed to a more reasonable 447 sq. ft. There are 19 reports on residence halls with 201 to 500 students. The median cost was than $24.7M and the median number of students 416. In terms of cost per student, and cost per sq. ft., these medium-sized residence halls appear to be the most economical, but they provide less space per student. Larger residence halls (24 reported) house more than 500 students each, with the median at 619 beds. One was designed to house 2,000 students. The median space for the 24 large residence halls was 314 sq. ft. per bed. Cost per student was $67,231. The projects ranged in total cost from just over $22M to $218M. The high-cost project housed almost twice as many students as the low-cost one, but each housed well over 500 students. The major difference was where they were located. One was in a rural community in the south, the other in the middle of a major city in the northeast. Labor costs, weather factors, and other considerations must be taken into account when making comparisons. WWW.PLANNING4EDUCATION.COM PHOTOS COURTESY OF HADP ARCHITECTURE, INC.